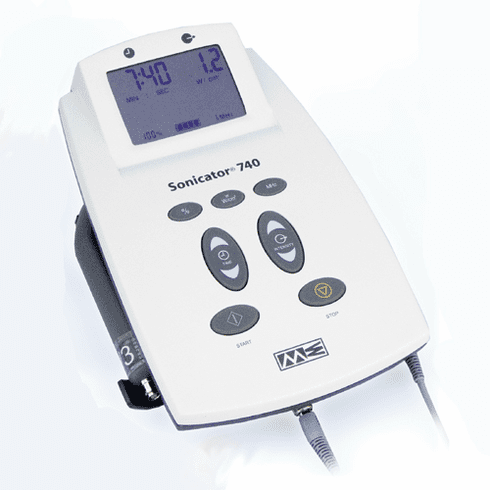 The Sonicator 740 is a microprocessor controlled therapeutic ultrasound unit with enhanced reliability and ease of use. With a large back-lit liquid crystal display you can see treatment settings and status regardless of ambient room lighting. Large controls on the silicon rubber keypad provide one touch entry for treatment parameters. Ultrasound may be delivered in continuous or 10, 20 or 50% pulsed modes. An optional rechargeable battery pack is available to free you from depending on wall power. The Sonicator 740 comes with a dual-frequency 5cm² applicator with direct crystal-to-patient contact. The applicator is contoured for easy ultrasound application and has a coupling LED in the handle that lights up when you have adequate coupling. The applicator attaches to the Sonicator 740 using the universal applicator cable.